The Jose De Diego Middle School in WynwoodOne of my favorite places to photograph is Wynwood, and one of the most interesting times to photograph Wynwood is when Art Basel is in town. This year was no exceptipn and we had some talented artists come and create some amazing work. This is a shot of the Jose De Diego Middle School. Over 40 artists where invited to paint at the school to bring attention to it's lack of an art program. 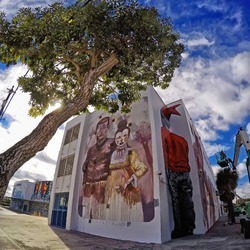 On the left side, behind the tree, there is a piece by Pixel Pancho. To the right, in the corner of the building there is a piece by MTO. The school is now covered in beautiful murals and has practially become an art museum.